Another year comes to a close for Live and Loud! 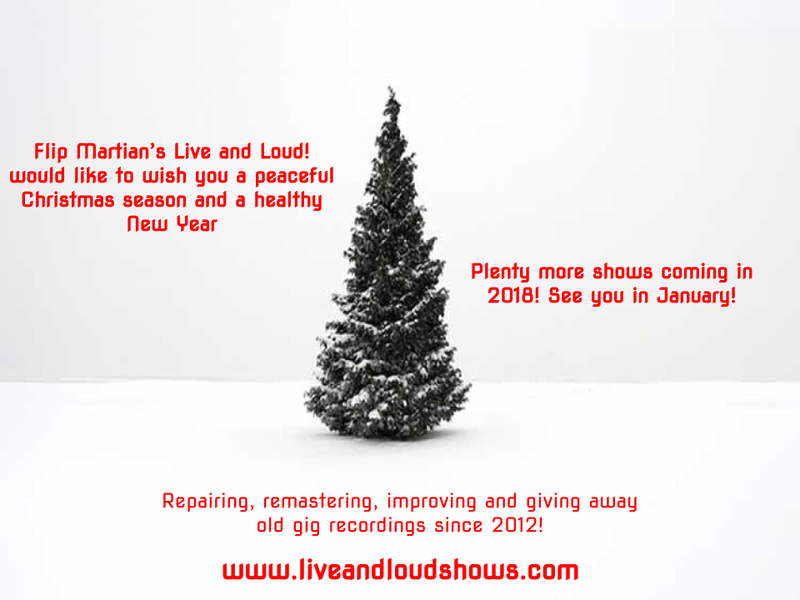 2017 saw 30 repaired and remastered live gig recordings and 3 repaired and remastered shows under the Live and Loud! Radio banner. We had new gigs from artists previously appearing and plenty of first time appearances which have proved popular - XTC, Bob Marley, Average White Band, The Cars, Sisters of Mercy, Sparks and so many more. Stay around as there is much more to come - both new repaired and remastered live gigs as well as more remastered radio sessions. For me personally its not been the easiest of years and life has changed somewhat. But I would like to thank you all for listening, downloading and sharing the links for your interest in Live and Loud!. While I do scour the internet to find shows to do, I've also had a few people who have got in touch and offered and given me shows to work on - thank you! Some of those have yet to be done I know, but I'll get through as many as possible (the "gigs to be done" list numbers in the hundreds, believe it or not). And finally to the select few who have been good enough to donate to the site - you really have helped keep this site going, so an enormous thank you to you especially. See you all in 2018 for plenty more shows! Merry Christmas!